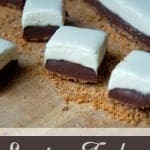 S’mores Fudge with a graham cracker crust and delicious marshmallow fudge topping sandwiching delicious chocolate fudge! If fudge is your thing, this is an easy fudge recipe that everyone will love. 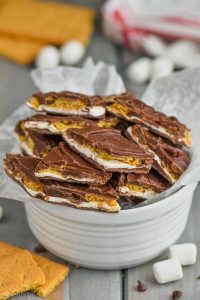 If you are looking for another great s’mores recipe, make sure to try my S’mores Bark. The other day Nathan and I were watching a show in bed late at night. It was intensely suspensful. One of the main characters, a young girl, that we’ve grown kind of attached to, was kidnapped. She was trying to get away, and she was running through a building looking for a way out. At this point I have buried my head in Nathan’s arm pit so he can protect me. All the while, I’m asking him what is going on. A little counterproductive, I know. He isn’t doing a really great job giving me the play by play, so I peak out. I see her run out a door and end up on a roof top, looking from side to side trying to get her bearings. She sees the Eifle tower, which is super weird, because we thought she was in NYC. She starts to lean over the edge of the railing looking to the street below and screaming for help when two giant arms reach from behind her and cover up her mouth and drag her away! As if that weren’t startling enough, I hear a SUPER LOUD scream in my house that nearly scares me to death. The TV screen goes black and it is the end of the episode. Ummmm . . . what? Sure, Nathan. If it makes you feel better we can say that it was me who screamed super loud like a little girl and nearly woke up the kids. Perfect for ghost stories around a fire pit or making amends with your husband for telling his secrets to the internet, let me introduce you to S’mores Fudge! 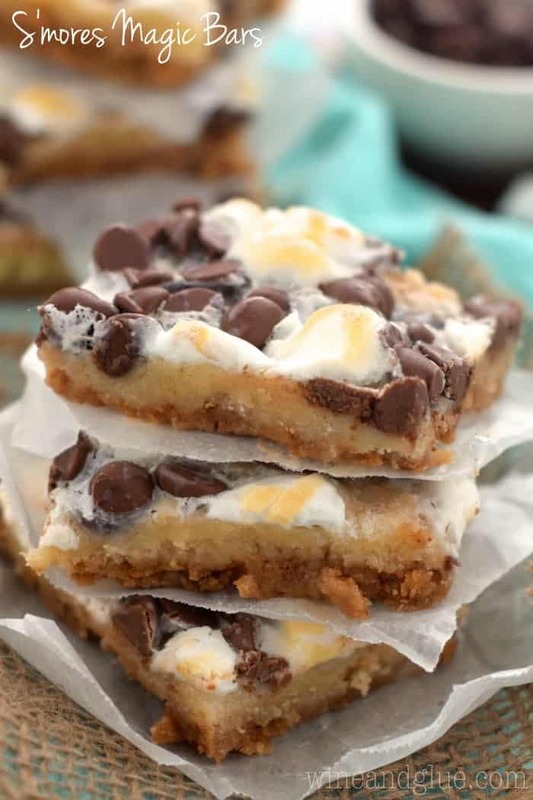 With a yummy graham cracker crust and a top layer of fudge made with marshamallow fluff, it absolutely tastes like a S’more, but with the richness of fudge. Nathan took the first batch that I made of this to work with him, and it was devoured. Want to see my favorite way to eat it? You turn a piece of the fudge over into the crumbs, like so. Getting graham cracker on the top and the bottom. One note about this recipe. Measuring marshmallow fluff is like trying to photograph an ice cream pie on an 81 degree day, messy and super frustrating. So just do your best. You can use anywhere from 1/2 cup to 1 cup. Less than 1/2 a cup and you won’t get that marshmallow flavor. Once you get closer to a full cup, it will make for some pretty mushy and melty fudge. 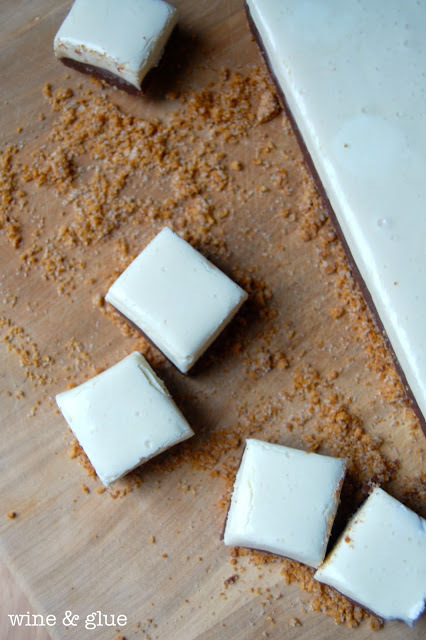 S'mores Fudge with a graham cracker crust and delicious marshmallow fudge topping sandwiching delicious chocolate fudge! 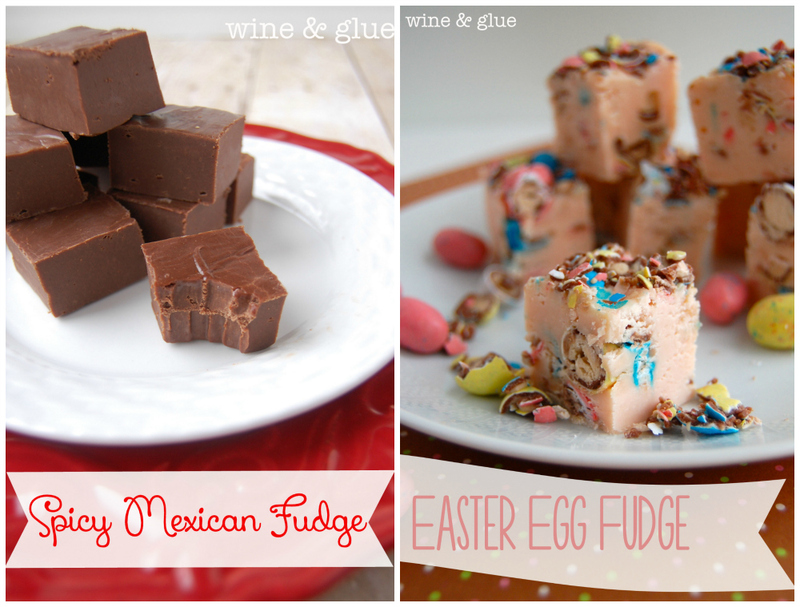 If fudge is your thing, this is an easy fudge recipe that everyone will love. Looking for more delicious fudge? Seriously Lisa? S’mores fudge??? This has to be the best fudge ever! 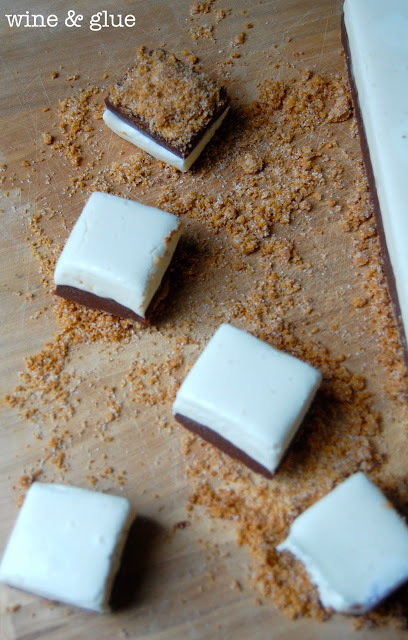 That marshmallow layer is killer and dipped in those crumbs! Forget the suspenseful tv, I’ll be in the kitchen chowing on these! What a fantastic idea!! All I’d do is add a crispy graham cracker right on top and munch until my tummy ached. Thanks for sharing this delicious treat! OMG. these showed up at office today. I found that when combined with Mountain Dew Code Red, they take on a fruity flavor. Love it! 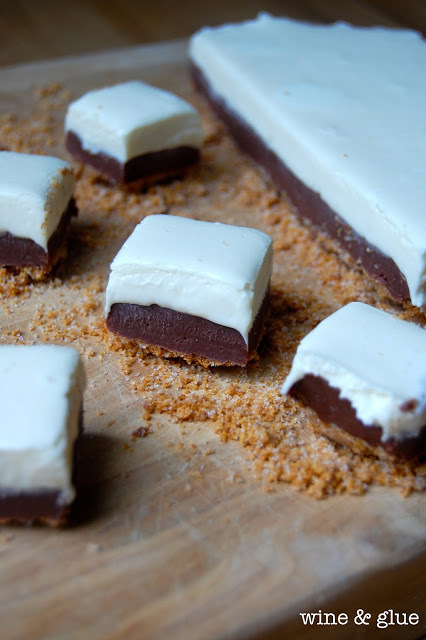 I’ve been hunting down S’mores themed desserts, and this one looks delish! I love that your hubby screamed like a girl while watching TV. To be fair, I can’t watch anything scary – ever. It gives me the chills and the never-sleep-agains. So, you’ve both got me beat in the bravery dep’t. K, this fudge looks UNREAL. It’s so gooey, I die! So is it weird that before I got to the Eiffel Tower part, I knew exactly what show you were talking about? If you haven’t already continued watching… Just wait!! Oh and I am totally in love with all things s’mores and LOVE this interpretation of it!! Can’t wait to try it!! This looks amazing, Lisa!! 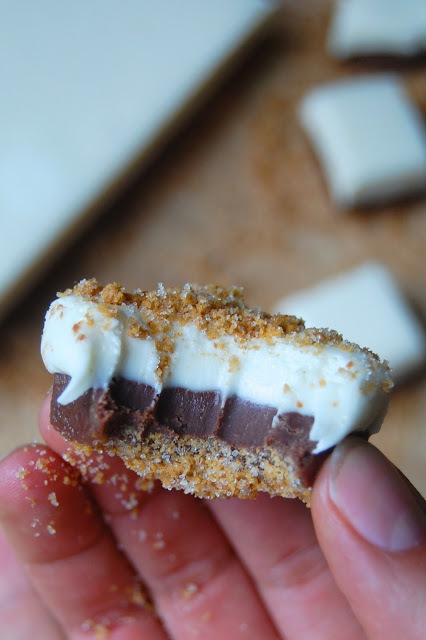 I love the different layers and the fact that, when you dip it in crumbs, it’s all sandwiched together like a real s’more! Delicious!! Best type of fudge ever!!! LOVE LOVE LOVE!! Do you send out deliveries?! My mouth is watering just looking at it! To be honest…you had me at Rick Castle 🙂 This beautiful fudge is just a bonus! This is a gorgeous fudge Lisa!!! Oh my goodness! Lisa, I am so in love with this recipe! How creative and so tasty, I’m sure. Love s’mores everything and can’t say I’ve ever had it in fudge form. 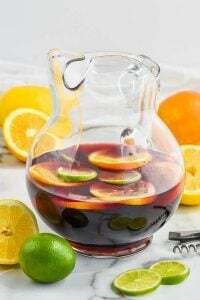 Gotta make this soon. My girls will love this! these look amazing! and OMG I KNOW. THAT EPISODE. I. KNOW. Lisa this looks incredible!!!! Pinned and I would love to make it. This would be super dangerous to have around. All the layers are things which I adore! 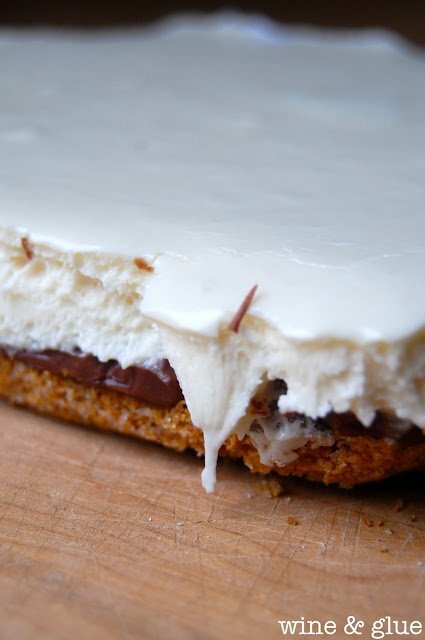 sweetened condensed milk, graham crackers, choc, Fluff – and I am so impressed how you kept such a super messy and gooey dessert to have the layers come out 100% totally neat, clean, and not a smudge on them! WOW! Lisa, I’m not sure whether to kiss you or curse you! 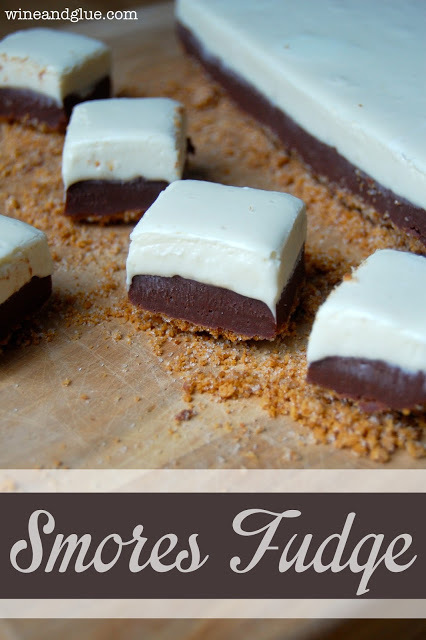 Smores Fudge, omg! I’m drooling here! Had to share on my FB page, thanks for linking up at Thursday’s Treasures! Hello hips, I thought I lost you 🙂 Seriously this is going to be made and shared all summer long I think. Oh yum! I think I died and went to smores fudge heaven! This looks amazing.. and simple too! Im going to have to try it soon! How creative! This looks amazing! A tip for measuring your Fluff, after you melt your butter, take a papertowel and wipe the excess butter out of the pan/dish and wipe your measuring cup and spoon with the butter. It will stick a little, but so much easier to deal with. 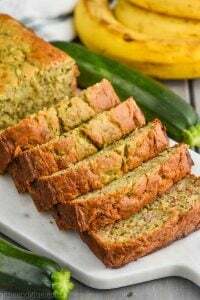 Recipe looks super yummy! I love Smores anything! Thank you for making it even easoer to have my fix. I pinned this badboy. This looks delicious Emily, I’d love a piece or two. I found your blog on Time to Sparkle. Yep. It’s official. I’m in love. Pinned and featuring tonight! when you say 1/2 can of sweetened condensed milk, is that the small (5oz) can or the larger 12oz can??? I used a 14 ounce can, and I just sort of eye balled half of the can for each of the layers, using a whole can in total for the recipe. 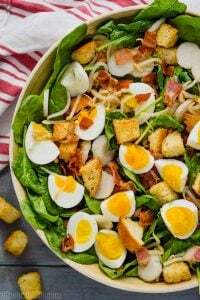 This recipe looks awesome, definitely on my ‘to try’ list now! We were! 🙂 Hope you like it Sandy! 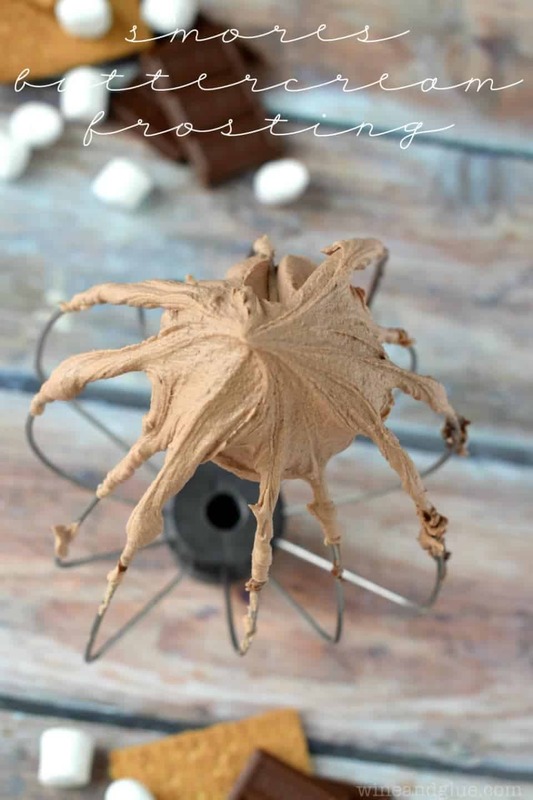 Good and easy, but be careful, the marshmallow layer sticks to the foil! How did you cut the fudge so cleanly? I am making this for sure. I measure marshmallow fluff with a peanut butter measuring cup works like a charm. And I cut my fudge with a pizza cutter. peanut butter measuring cup??? I NEED this! where do I find one please? but I’m not waiting to make this fudge! This looks fabulous! I will definitely be making it this week. How long does this keep for in the fridge? I actually don’t keep my fudge in the fridge, Ashely. I like it better kept at room temperature in a sealed container, and I feel like it works for about two weeks. Laura, in all honesty, I made this SO long ago, though if it needed time between the layers, I think I would have put in the instructions to put it in the refrigerator in between. I do think that if that is the issue you are running into you can refrigerate the chocolate layer and then you won’t have any trouble. Sounds yummy..Love anything chocolate, so I will be trying this before my New Year diet kicks in. BTW..I know what show you were watching..the episode of Castle when his daughter gets kidnapped. What % milk do you use? Hi Lisa! There’s actually no milk in this . . . there is sweetened condensed milk, which you can find in a can in the baking aisle. And there are milk chocolate chips, but you could also use semi-sweet. Just found this via Pinterest and it looks amazing! My favorite part of smores is the toast on the marshmallow, would that translate to this recipe? Maybe toast the marshmallow layer with a torch? Thanks! I love that part of s’mores too!! Totally worth a try! Just go easy so you don’t melt the fudge! Unfortunately, this was a Pinterest fail for me as well. 🙁 Next time I will try refrigerating the milk chocolate layer first! Sorry to hear that Brooke! If I don’t have time to refrigerate overnight, could I place in the freezer for a few hours to set? I haven’t done it, but it’s worth a try. I made these using dark chocolate instead of milk chocolate , the end result is there are no more everyone in my family devoured them. Delicioso ???? I’m so glad your family liked it! 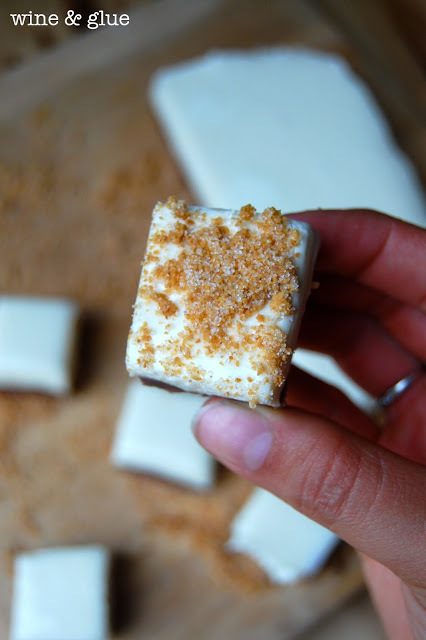 You know I’ve never been a huge fan of fudge but I think my attitude might change once you involve marshmallow and graham crackers;-). These look great! Thanks for the recipe! Can you please tell me what 4 sheets of graham wafers is equal to in cups or ounces? I only have graham wafers crumbs are packaged in sleeves. My four year old is obsessed with all things S’mores. Thank you for this recipe!!! Castel is one of my favorite shows, it’s ashame they took it off. I’m getting ready to make the s’mores fudge now. Love your recipes. I hope you loved it Brenda! Yes, this looks amazing. However, I’d like to gently suggest that in the time it takes to make it that you put the full amount of time. After wading through all of the advertisements I finally got to the place where it said “ refrigerate overnight”. Thankfully I didn’t start this without reading thoroughly. Though it makes sense that it would need refrigeration, I was searching for a quick recipe for a class. Because yours stated 35 minutes prep time it came up with the others. Please don’t be offended; just thought it might help. Hi Pamela, Sorry about that! I’m definitely not offended. It’s a little tricky because it’s a form that I have to fill out with no easy place to list refrigerate overnight so it shows up front. That being said, I just wanted to mention about your comment related to the advertisement. You may not realize this, but this is actually my full time job. Its what puts clothes and shoes on my kids, and a roof over our heads. I put in between 40 and 60 hours a week and am paid through the ads that are on my site, providing free recipes to readers. So, please don’t be offended when I say this, but I feel really strongly about explaining why I have ads on my blog.